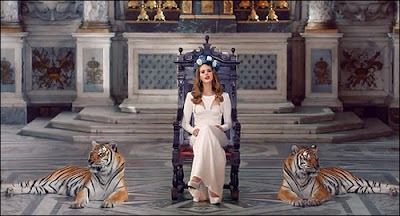 The video for Lana Del Rey's new-but-not-as-good-as-Video-Games single Born To Die popped up on YouTube last night. Compared to the patchwork montage of her previous videos, it's incredibly lavish. She's surrounded by tigers in a gothic chapel, kissing some guy who can't afford a shirt, and generally playing up the whole "femme fatale" thing. There are certain realmusicfansTM who have turned against Lana Del Rey after discovering that she'd ditched her first album, worked with new producers and bought some funny lips like Chelsee Healey off Strictly Come Dancing. These same people will also tell you that David Bowie is a godlike genius because he changed his name, experimented with a number of voguish musical styles, and spent two years pretending to be an alien. So what do they know? If you can bear to listen to this "fake", "manufactured" chanteuse after all that opprobrium, here is the video for the song that she has sung.